Reciprocating compressor also known as a piston compressor is a positive displacement device. It is one of the most widely used types of compressor in which gas is compressed by reciprocating motion of a piston. It handles low mass of gas but high pressure ratio. During the operation of reciprocating compression, it takes a large amount of gas from the suction line, it is then get compressed by the reciprocation motion of piston driven by the crankshaft, and then it discharges the compressed gas to the discharge line. There are two types of reciprocating compressors are for a general purpose. Single acting reciprocating compressor and double acting reciprocating compressor. In single-acting type, the compressor cylinder usually arranged in the vertical position while in double acting the compression cylinders are normally arranged in horizontal. Figure shows the line drawing of the simplest form of a reciprocating compressor. It consists of a piston, inlet-outlet valves, cylinder with an adequate cooling arrangement, connecting rod and crank. The pistons are fitted with piston rings to avoid gas leakage. Both valves are designed to quick and leak-free operation. The piston is connected to crack through the connecting rod. A prime mover (engine, or motor) runs the crankshaft and it is connected to connecting road. 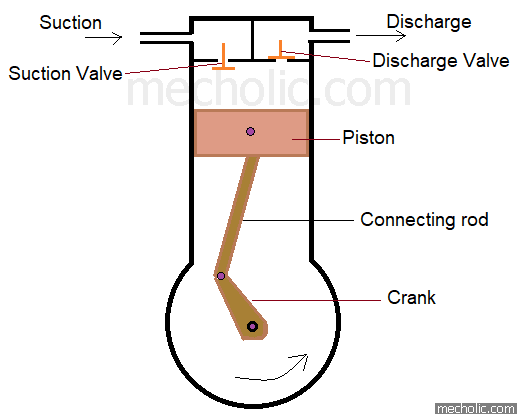 This arrangement transfer the rotation of the engine to reciprocating motion of piston. The working of this compressor is same as the compression stroke of two-stroke engine. The working cycle of the reciprocating simple reciprocating compressor is described below. Let us assume the compressor starts when the piston is at top of the cylinder, TDC (Top dead center). In this position, both the suction valve and discharge valve is in a closed position. When piston starts to move downward from TDC to the bottom side of the cylinder BDC (Bottom dead center) the residual gas (refrigerant) from the previous cycle in the cylinder gets expanded which reduce the pressure inside the cylinder. At the same time, the suction valve is opened and the large amount of fresh gas is flowed into the cylinder. The flow will continue until the piston reaches the Bottom. At BDC of stroke, the suction valve again gets closed. Now the piston moves from BDC to TDC (compression stroke), the cylinder volume decreases, pressure increases and the gas get compressed. When the pressure inside the cylinder exceeds the pressure on the top of the discharge valve, the discharge valve gets opened and the compressed gas is flow to the discharge line. For a single acting reciprocating compressor both suction and compression stroke of completed in one revolution of the crankshaft. Reciprocating compressor used to produce high-pressure gas output. Reciprocating compressor is mainly used in the refrigeration cycle. It is widely used in oil refineries, gas pipelines, natural gas processing plants, chemical plants, etc. it is also used in blowing of the plastic bottle. Used to produce high-pressure gas. It can compress gases and refrigerant of a wide range of molecular density. One of the drawbacks of the reciprocating compressor is that it cannot self-regulate its capacity against a given output pressure, it will continue displacing the gas until told not to do. 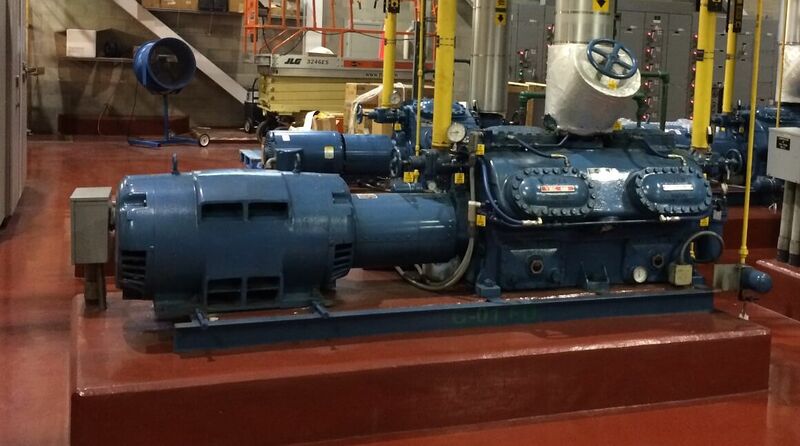 The size of compressor is very large for a given capacity. Part of the work input is lost due to frictional resistance between the piston and cylinder. Pulsating of fluid flow. The operation can be made smooth by using a flywheel. Piston rings and valves are extremely sensitive to the dirt present in the fluid.